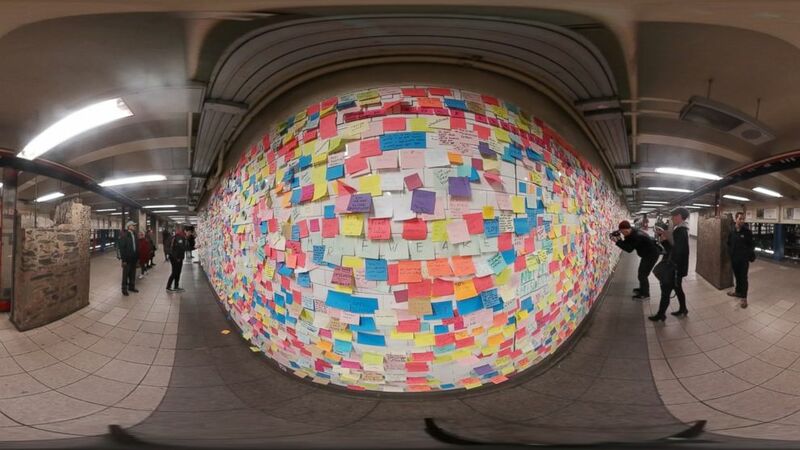 Explore hundreds of sticky notes from venting New Yorkers. camera (Adam Rivera/ABC News) Sticky notes cover New York's Union Square subway station in act of protest, Nov. 14, 2016. In cities across the U.S., protesters have taken to the streets to show their discontent with the result of the presidential election. However, underground in New York City, a different kind of protest is taking place, with commuters posting sticky notes along a subway tunnel's walls to express their thoughts, opinions and hopes for the future of this country. Explore in this 360 video below by dragging the video with your mouse or watch on mobile with the Facebook app.